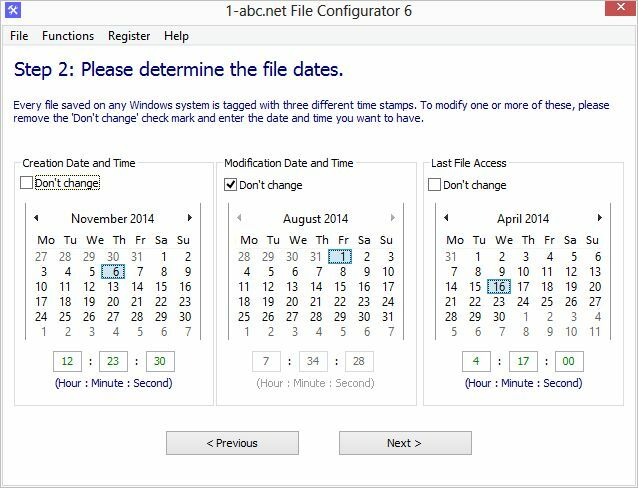 1-abc.net File Configurator - edit file attributes that you are not allowed to change normally! Edit file attributes that you are not allowed to change normally! A situation as it happens very often nowadays: You made lots of photographs with your digital camera. Then you copied them to your hard drive and after that you see that the camera clock and calendar was not configured correctly. Windows saves time and date of the creation, the last access and when the last modifications were done to that file. Changing to another date in the past or the future is normally impossible. Users of 1-abc.net File Configurator can just laugh about it. A very easy to use interface in wizard style allows you to define your wishes with 4 easy steps. In a first screen you can add all files you want to configure to a list. You can even add whole folders. Your modifications will be done to all files in it including all files in sub-folders then. The second screen allows you to determine these three existing file dates and times down to seconds for the files you want to change. The third screen offers more file attributes like ‘read-only’, ‘hidden’, ‘archive’ or ‘system’. 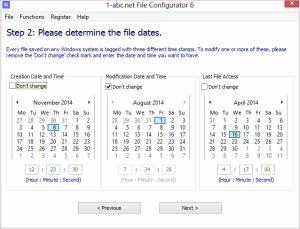 If you want to change such file attributes to all files in your list, 1-abc.net File Configurator is your perfect batch mode tool. Trying this with Windows Explorer could take hours for 100 files, with this tool it is just a few clicks. The last step includes more file configuration options that could also make sense from time to time. You can decide if the modified file should be backuped before or saved to another folder. You can change file extensions to your needs and you can change file names to upper or lower case. After entering this data the program changes all these dates and attributes automatically!